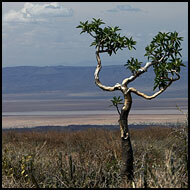 Suguta lies in North West part of Kenya and its considered as one of the remotest and the hottest places. The more we crawled into its heart, the more hot it got, grass turned into dry golden prickles, lonely trees reminded of ghosts by their shape and soil was replaced with reddish stones. Is this a way to hell? one could be thinking. The worse was still to come.